Ah, the Sunshine State. 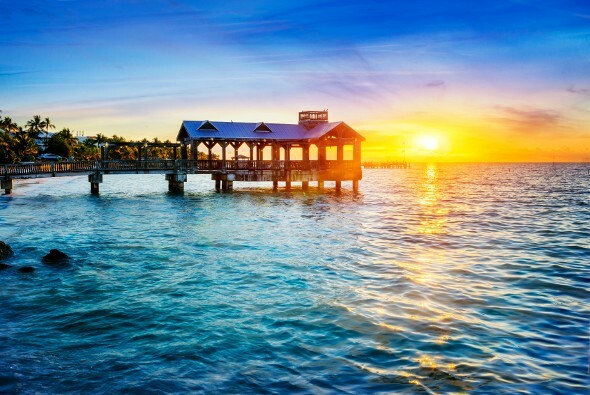 Whether you love Florida for Disney, spring training, Art Basel or the Keys, you’ve probably thought about moving there, especially on a cold winter day in another state. Florida is a popular destination for retirees for a reason. Cities like Jacksonville house some of the top financial advisors in the state, not to mention the warm weather and low taxes. But just how affordable is Florida? Let’s take a look. Florida was hit hard by the housing market crash. The state suffered a high rate of foreclosure and home values took a dive. Florida is recovering, though, as you can see in the chart below. Today, if you want to buy a home in Florida, the average sales price is $200,000 according to realtor.com. But home prices vary greatly by county. According to zillow.com, the median sales price in Monroe County is $409,000, while the median sales price in Hardee County is just $50,000. 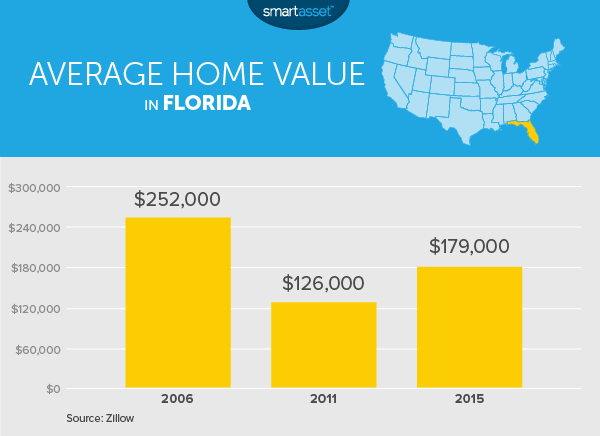 Check out the chart below to see how the average home value in Florida has fluctuated over the years. It fell from $252,000 in 2006 to $126,000 in 2011. It has since rebounded to $179,000 in 2015. Our list of the top banks in Florida may offer some great mortgage and banking opportunities for new and existing residents alike. Still not ready to make a down payment on a home? Here’s what you should know about rent in Florida. According to myapartmentmap.com, the average rent for a studio apartment in Florida is $1,223. That’s $115 above the U.S. average. One-bedroom apartments go for a monthly average of $1,150, $152 above the national average. The average rent in Florida jumps to $1,587 for a two-bedroom apartment, fully $366 higher than the U.S. average. And you’ll pay an average of $1,839 per month for a three-bedroom apartment. That’s $308 above the national average. Florida’s energy prices are on the high side, with an average monthly electricity bill of $129.86, according to the U.S. Energy Information Administration (EIA). That’s 12% above the national average of $114.11. Florida residents pay an average of $24.41 per thousand cubic feet of natural gas, according to the EIA. Do you associate Florida food with gator, Cuban food, citrus, seafood or key lime pie? Whatever your food style, you’ll pay more – or less – depending on where you live. But the average is still low compared to other states. Florida is a low-tax state, which means that taxes don’t pay a huge role in the cost of living in Florida. The average effective property tax rate in Florida is 1.1%. This is below the national average. Plus, there’s no state income tax in Florida. No wonder so many people choose to spend their golden years in the Sunshine State. Florida has a statewide sales tax of 6%. Some counties add their own sales tax to that 6%. The state has a top sales tax rate of 7.5%, though, which is lower than the top rates in other big states like California and Illinois. The bad news is that Floridians pay high gas taxes. Florida’s gas tax is 36.42 cents per gallon, the 11th-highest in the nation. There are also special taxes on alcohol of 48 cents per gallon of beer and $6.50 per gallon of spirits. A special tax on communications services means consumers pay 6.65% extra on all phone, internet and television services. Floridians pay a tax of 10.8% on satellite services like DirecTV. Want a financial advisor to aid you in managing your overall assets, as well as your taxes? Our list of the top financial advisor firms in Florida can be a huge help in narrowing down your choices. Need to see your primary care physician? Expect to pay around $96 in Miami, according to Castlight Health. The average price in Orlando is $112, $113 in Tampa. Jacksonville residents pay an average of $136. According to the National Conference of State Legislatures, health insurance premiums rose by 7% between 2014 and 2015. The average monthly premium for a catastrophic plan in Florida is $249. For a Bronze plan, it’s $303. Want a Silver plan? Expect to pay around the average of $369. That rises to $419 for a Gold plan and $487 for Platinum. According to gasbuddy.com, Florida’s gas prices average $2.062 per gallon. That’s right around the U.S. average of $2.046. Commute time in Florida averages 25.78 minutes. Like Florida’s gas prices, the state’s commute time is right around the national average (25.4 minutes). Public transportation options in Florida aren’t amazing – the Sunshine State is a driving state. A monthly pass for public transit in Miami-Dade County will cost you $112.50, or $56.25 if you qualify for a reduced fare. A 31-day STAR card for Jacksonville’s public transportation costs just $50, with a reduced fare of $30. A monthly pass for public transit in Orlando also costs $50, or $25 for the reduced fare. Florida has plenty of major league sports teams to keep fans happy. 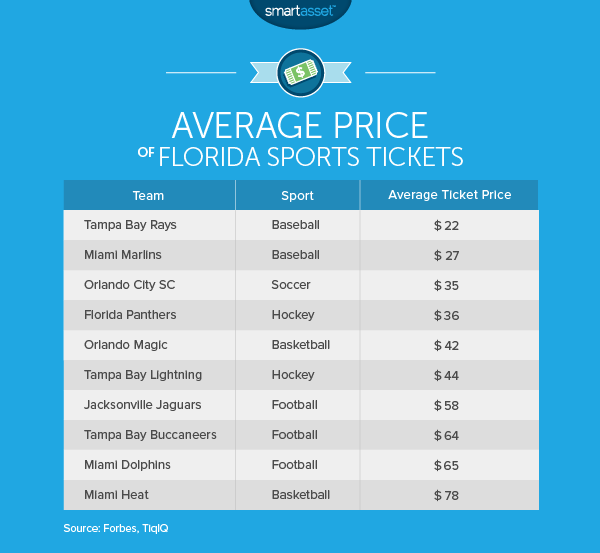 Here’s how the average ticket price of different Florida teams stacks up. As in other states, baseball games carry the lowest average ticket price. Fans of the Miami Heat basketball team will pay the highest average ticket price to catch a game. If you want help transitioning to the Sunshine State financially or meeting your financial goals in general, talking to a financial advisor might be useful. But wading through the options may seem daunting. A matching tool like SmartAsset’s can help you find a person to work with to meet your needs. First you answer a series of questions about your situation and your goals. Then the program narrows down thousands of advisors to three fiduciaries who meet your needs. You can then read their profiles to learn more about them, interview them on the phone or in person and choose who to work with in the future. This allows you to find a good fit while doing much of the hard work for you. It’s also a good idea to understand how your new location will impact your new budget before you make the move. SmartAsset’s free budget calculator can give you a sense of the average budget of a person in your new neighborhood. Have a question? Ask our Home Buying expert. An award-winning writer with more than two decades of experience in real estate.